100% free serial number for NovaPDF Lite 9. Current price the application is $19.95 but now it absolutely free. The vendor, Softland software giving away unlimited free NovaPDF Lite 9 full license key for users who want to use the software. Version 9 is the latest version and this software freebie available for a short time only. Before offer expires, you can download the software for free. 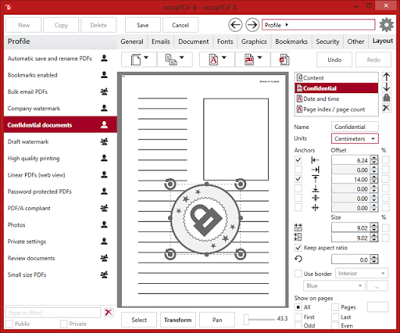 NovaPDF is a software for creating PDF file from any printable documents. The software will install it self as virtual printer. On the printer list, you view new printer named NovaPDF after installing the software. Use the virtual printer to create PDF document is like using physical printer. The PDF files created using the tools is compatible with any PDF viewer. Download the free serial key for novaPDF. It a short time giveaway. Before the giveaway expires, you can grab the one free activation code from the following giveaway page. Softland gave unlimited number of license key on the offer. On this short time promo you can get unique serial number by registering on the giveaway page. Fill up the online form by entering your valid email address then send the form. The activation code will be send within a few second/minutes after submitted the form. Check your email inbox or check your spam folder if within 5 minutes does not receive the serial number. Unfortunately the giveaway will ended soon. After receive a license key you can download installer the giveaway version here: noovapdf-full.exe (37 MB). Create PDF from any type of printable documents just in a few mouse easy clicks. Allow user to merge many PDF files into one file. supports TrueType, OpenType and Type1 fonts and allows you to embed them all. International character and multi-language supported. Added firewall exception for service port during setup. Customize paper option before starting creating a PDF files from printable files. Smaller PDF files due to compression algorithm updates. The tool is compatible with 32-bit and 64-bit editions of Windows OS. It works on Windows XP SP3, Vista, Windows 7, Win 8/81, and Windows 10. Also supports Windows server version. NovaPDF is my favorite tools on my computer. If the giveaway expires, you can buy the full version or use alternative software. There many alternative tools like novaPDF. One of the tool is ABBYY FineReader. The software can create PDF file also features with many extra tools. It also can convert PDF and edit the file. The best features is OCR technology that can makes scanned PDF into editable format.